Grandpa Grunden (Harvey) started a tradition that he would give each grandchild a gelding when they turned eight years old. After much deliberation, Megan chose this horse. She did not have a name picked and Grandpa nicknamed it Chester, and the name stuck. 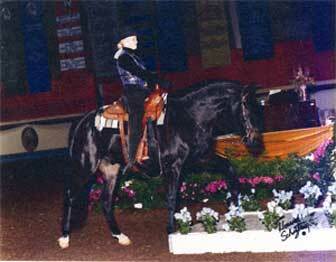 Chester's sire is Funquest Cafallero, one of our past herd sires. Megan and Chester have been a team from day one. Megan broke Chester to ride and drive by herself. 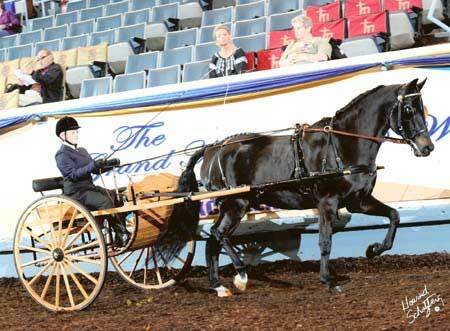 They do everything from moving cattle and other ranch work to showing Western, English and Carriage Driving. Chester also carried Megan to the title of "Elwood Rodeo Queen". She has set her sight for more queen titles with Chester and Dad says it would be cheaper to go buy the buckle. 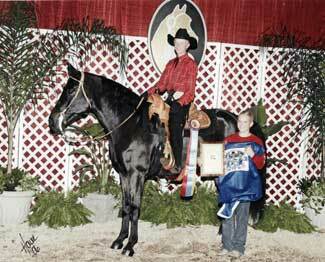 Chester's show record includes many Hi-Point Horse Awards at local shows, County Fair, State Fair, and The Grand National and World Morgan Show. One of Chester’s highlighted accomplishments was Grand Champion Western Pleasure at a District 4-H Show with a Quarter Horse judge in the heart of Quarter Horse country. Another one of his highlights was when he won the Grand National and World Youth Trail. Chester is known around the state and especially in the surrounding communities. He has been used in Animal Safety Demonstrations for Farm Safety Day Camps for several years. He has also been used at the FFA Petting Zoo. Chester has babysat and gave rides all day long.